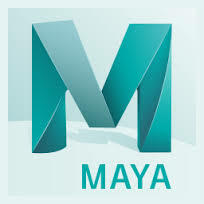 Photosynthesis is the means by which plants make use of chlorophyll and light to produce energy. The process of Photosynthesis produces ATP from ADP and Pi by using the energy from light to excite electrons that are passed along an electron transport chain. Coupled with the transfer of electrons is the pumping of hydrogen ions and the splitting of water molecules. 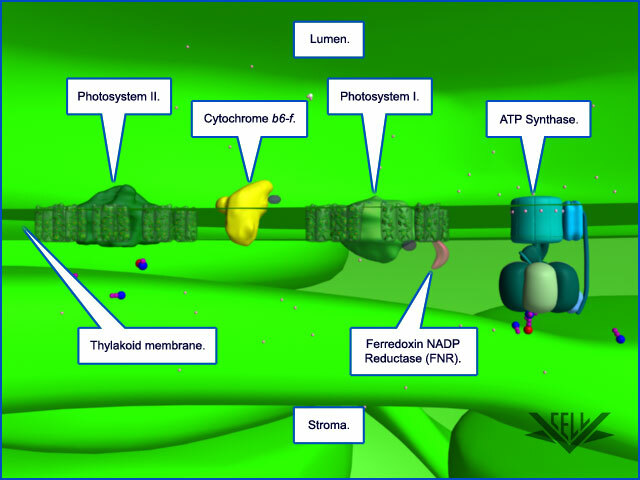 The following complexes are found in the photosynthesis electron transport chain: Photosystem II, Cytochrome b6-f, Photosystem I, Ferredoxin NADP Reductase (FNR), and the complex that makes ATP, ATP Synthase. 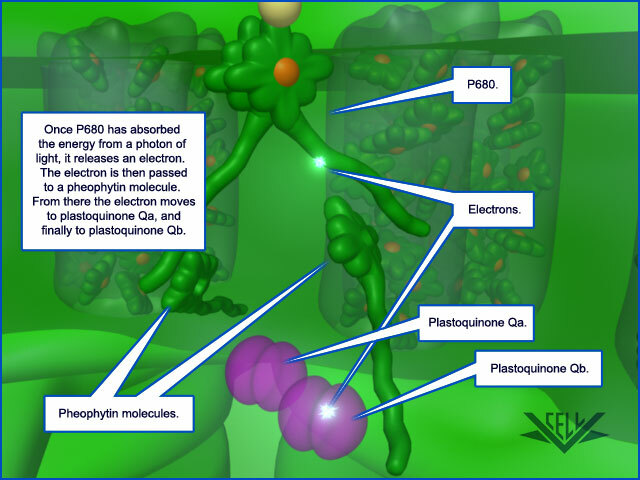 In addition to the complexes, three mobile carriers are also involved: Plastoquinone Qb, Plastocyanin, and Ferredoxin. 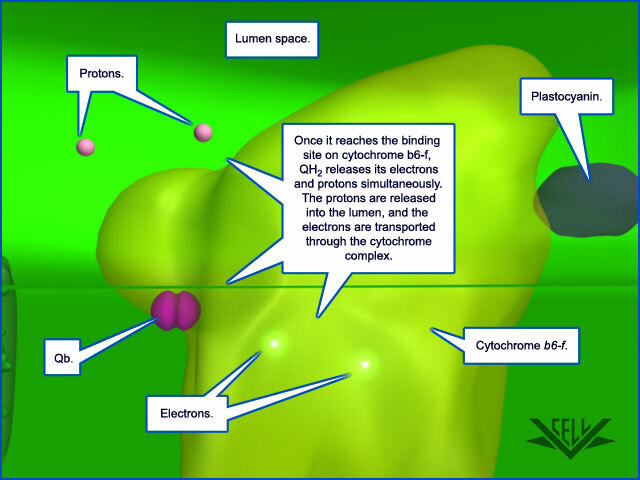 Other key components include: photons, chlorophyll molecules, protons, water, molecular oxygen, NADP+ and the electrons to form NADPH, and ADP and Pi, which combine to form ATP. Photosynthesis occurs in the chloroplasts of plants and algae. The process is also found in single-cell organisms such as cyanobacteria that do not have chloroplasts. 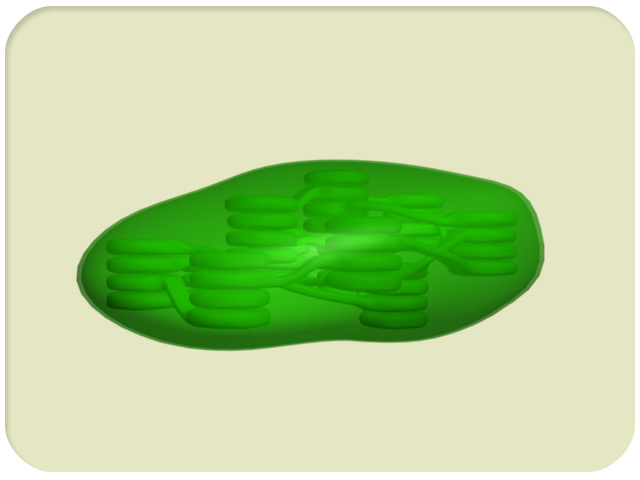 Like its mitochondrial counterpart, the chloroplast electron transport chain consists of several protein complexes and mobile electron carriers. 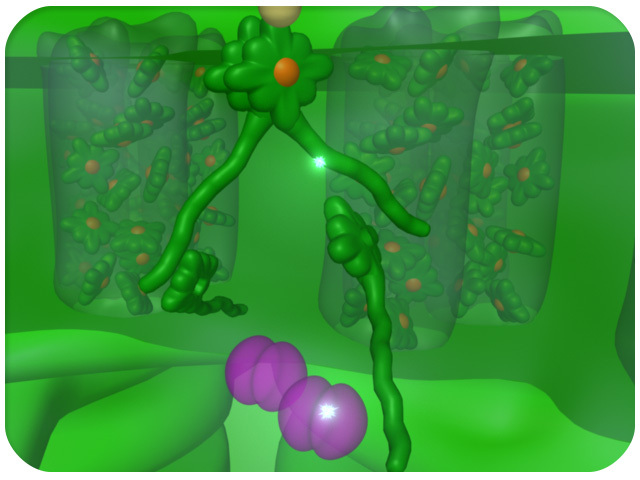 First, a photon of light hits a chlorophyll molecule surrounding the Photosystem II complex. This creates resonance energy that is transferred through neighboring chlorophyll molecules. When this energy reaches the reaction center embedded in photosystem II, an electron is released. 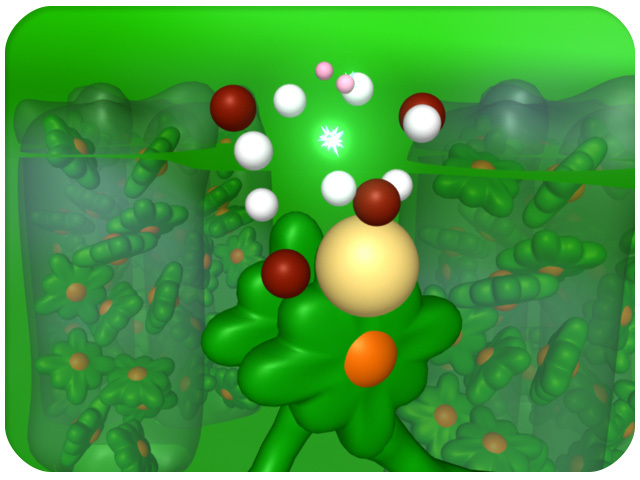 The reaction center chlorophyll contains electrons that can be transferred when excited. 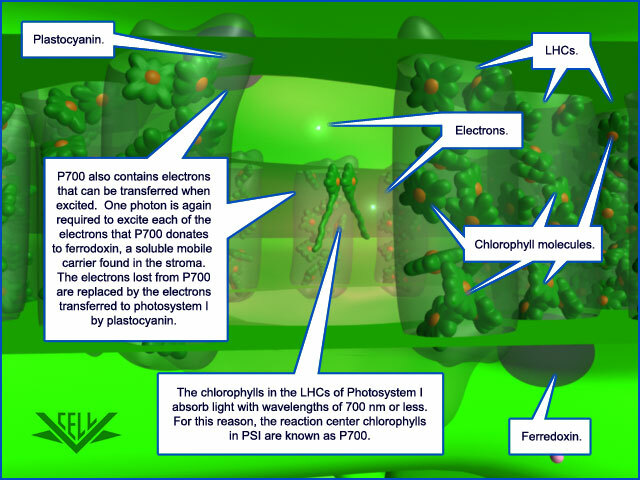 One photon is needed to excite each of the electrons in this chlorophyll. 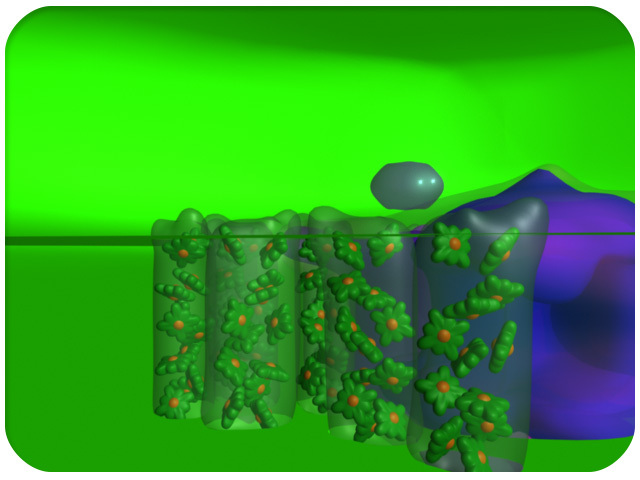 Once excited, two electrons are transferred to plastoquinone Qb, the first mobile carrier. In addition to the two electrons, Qb also picks up two protons from the stroma. 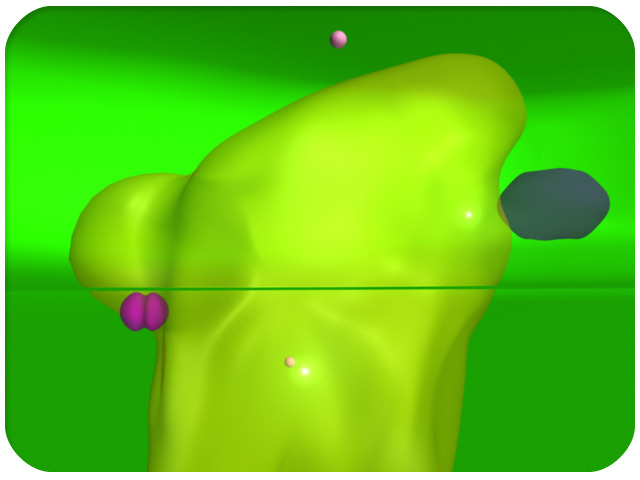 The two electrons lost from photosystem II are replaced by the splitting of water molecules. Water splitting also releases hydrogen ions into the lumen. This contributes to a hydrogen ion gradient similar to the one created by mitochondrial electron transport. 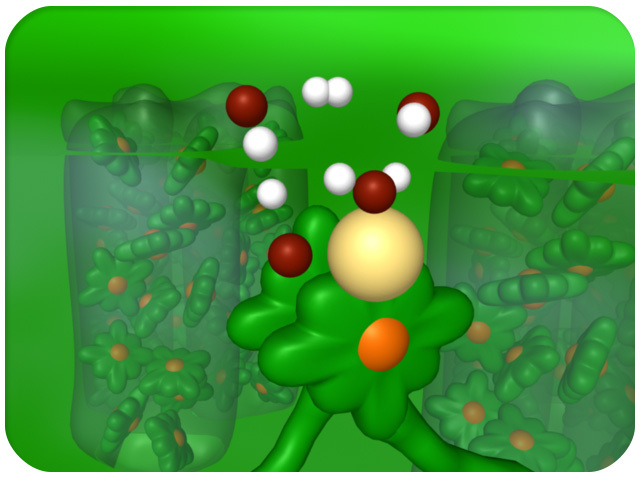 After two water molecules have been split, one molecule of molecular oxygen is created. 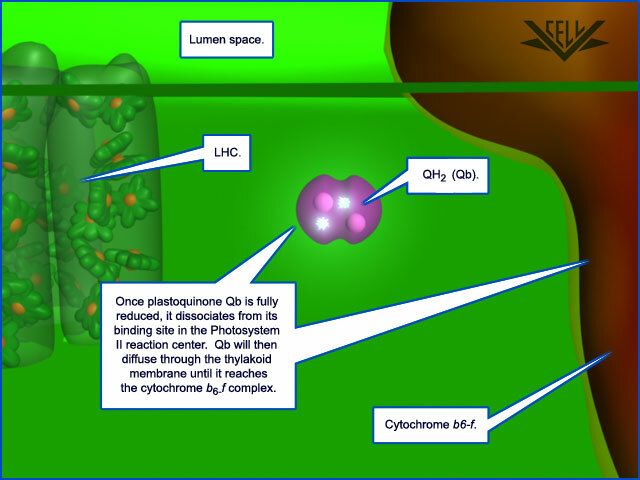 Plastoquinone Qb then transfers the two electrons to the cytochrome b6-f complex. The two protons it picked up are released into the lumen. 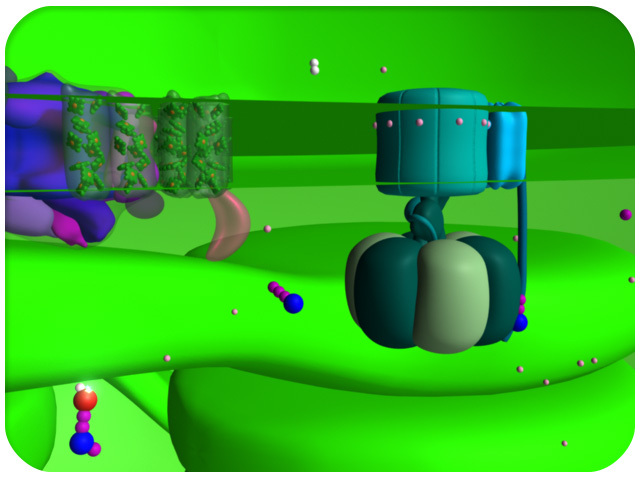 These transfers are coupled with the pumping of two more hydrogen ions into the lumen space by cytochrome b6-f. 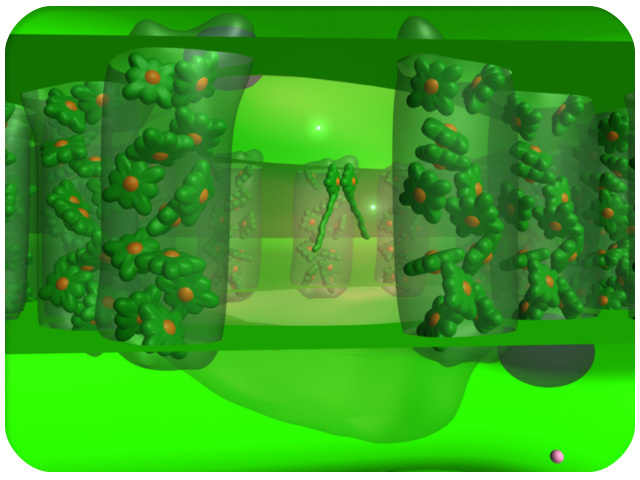 The electrons are next transferred to plastocyanin, another mobile carrier. 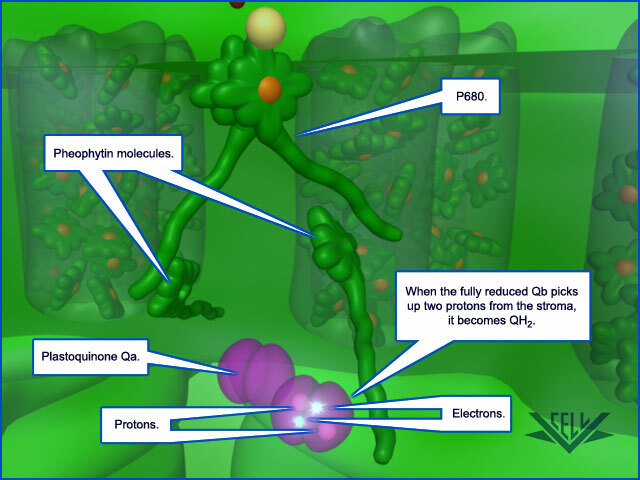 Next the electrons are transferred from plastocyanin to the Photosystem I complex. It is here that photons again energize each electron and propel their transfer to ferredoxin. Ferredoxin then transfers the electrons to the ferredoxin-NADP-reductase, also known as FNR. After two electrons are transferred to FNR, NADPH is made by adding the two electrons and a hydrogen ion to NADP+. 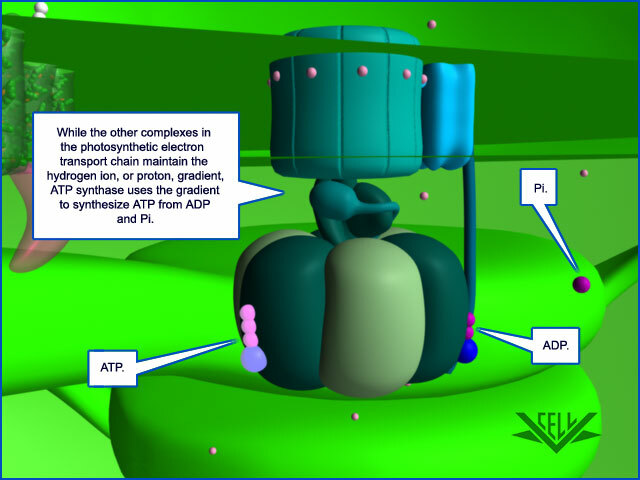 The hydrogen ion gradient created by the electron transport chain is utilized by ATP synthase to create ATP from ADP and Pi. This is similar to the way ATP is synthesized in the mitochondria. 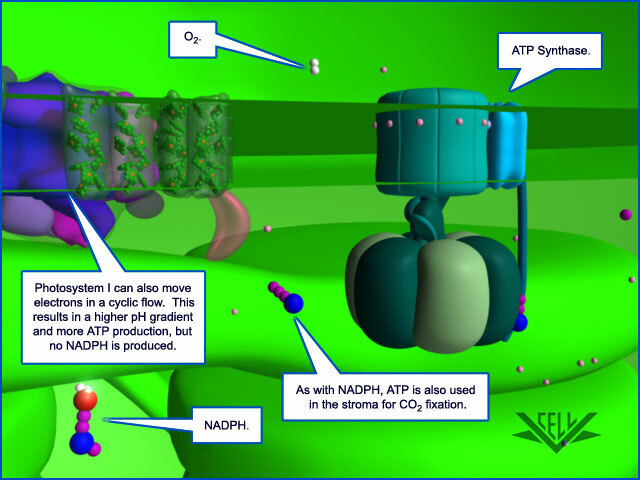 ATP, NADPH, and molecular oxygen are the final, vital, products of photosynthesis. Photosynthesis occurs within the chloroplast. 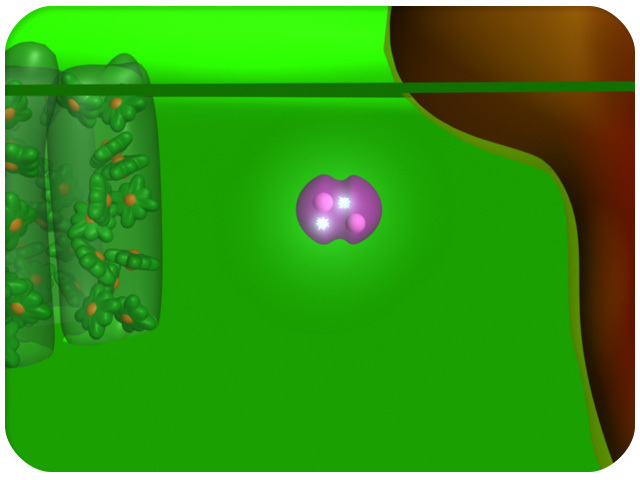 A cellular organelle found in plants and some algae. 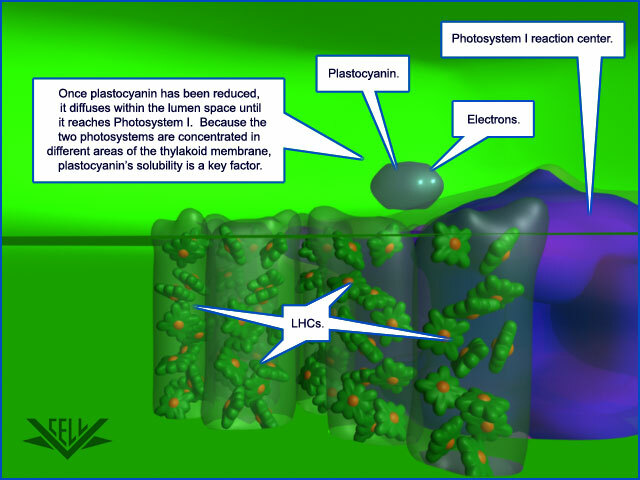 Photosynthetic reactions also happen within cyanobacteria, which do not have chloroplasts. 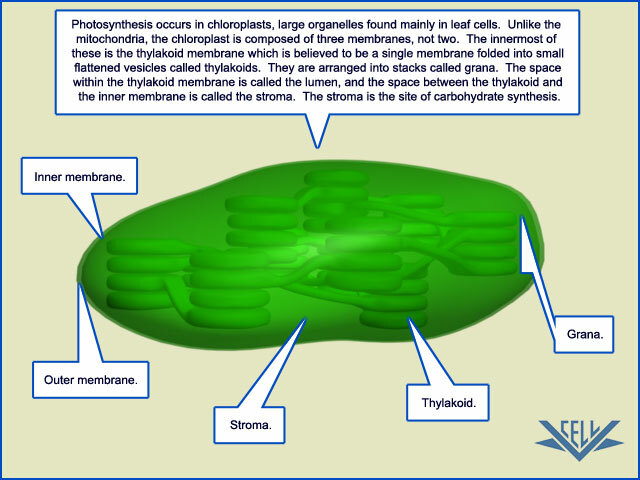 The photosynthetic electron transport chain is embedded in the chloroplast's thylakoid membrane. 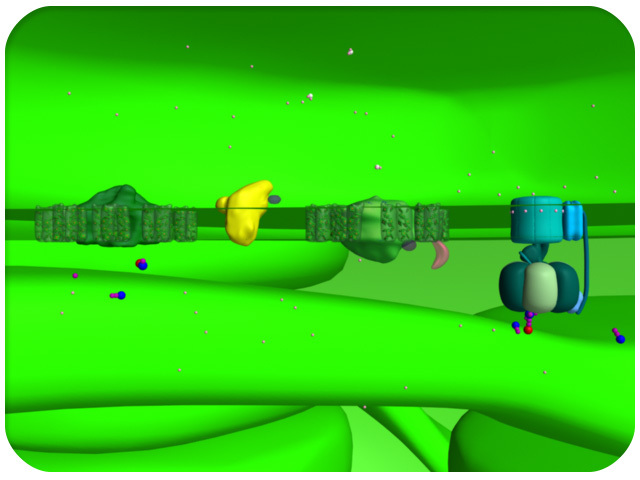 It consists of four large protein complexes, one small protein complex, and three smaller mobile carrier proteins. The space within the thylakoid membrane is called the lumen. 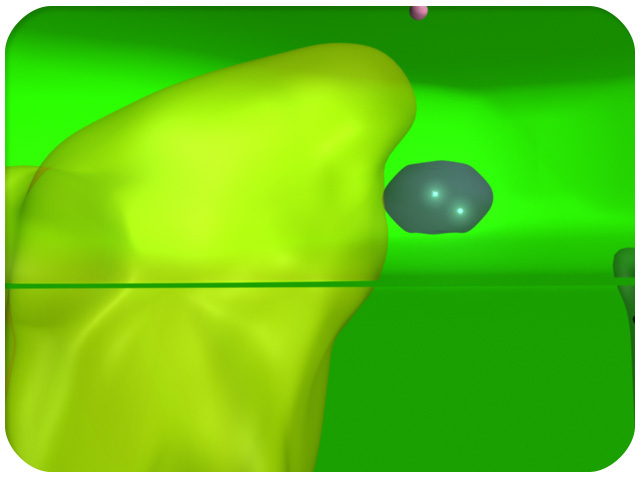 The space surrounding the membrane is called the stroma. 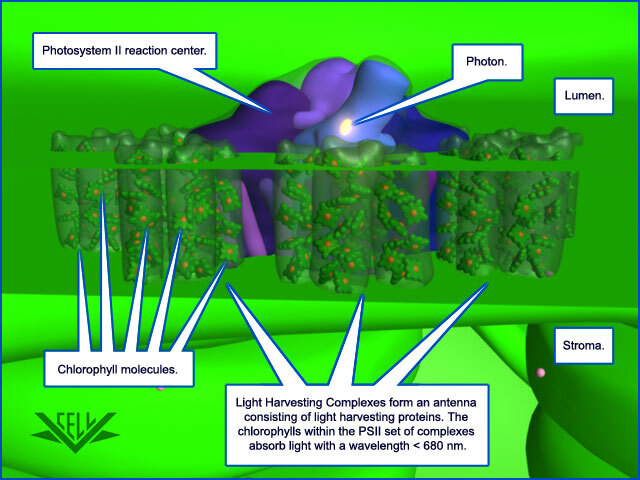 Photosystem II contains an antenna structure known as the light harvesting complex (LHC). 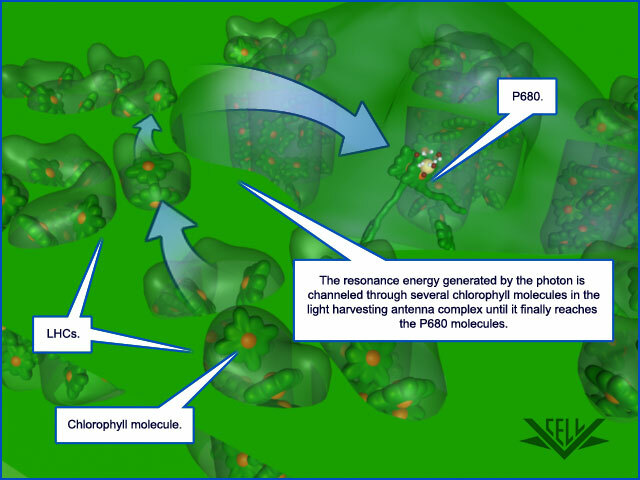 This complex contains chlorophyll molecules that transform the energy contained in photons of light into resonance energy. 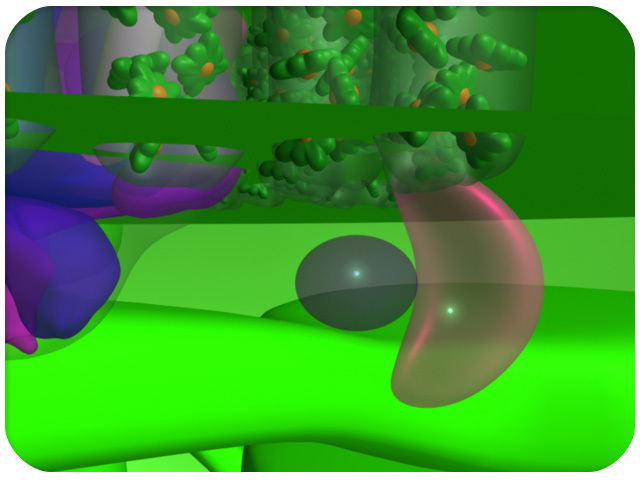 The resonance energy is transferred from one chlorophyll molecule to another within the LHC until it is funneled into the reaction center of Photosystem II. 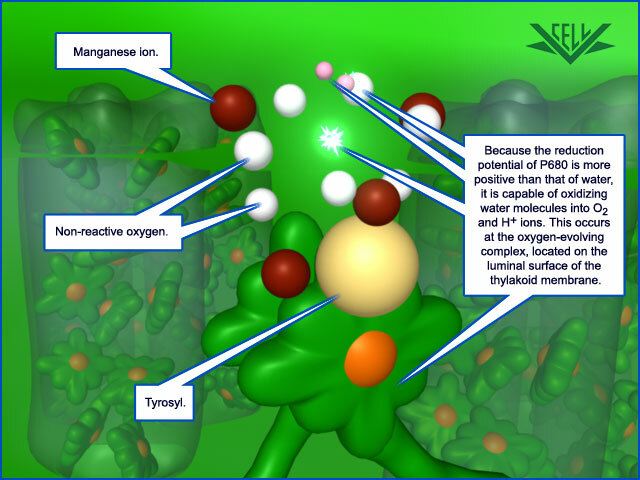 At the heart of the reaction center is a special pair of chlorophyll molecules known as P680. Within P680 are electrons that can be excited by resonance energy. One photon of light is needed to excite each electron. 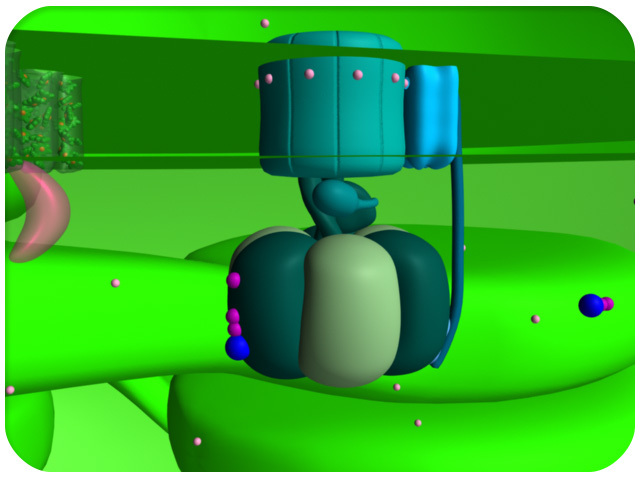 Once excited, each electron is transferred to Qb (magenta), a mobile carrier protein. Qb accepts two electrons from P680 and also picks up two hydrogen ions (protons) from the stroma. 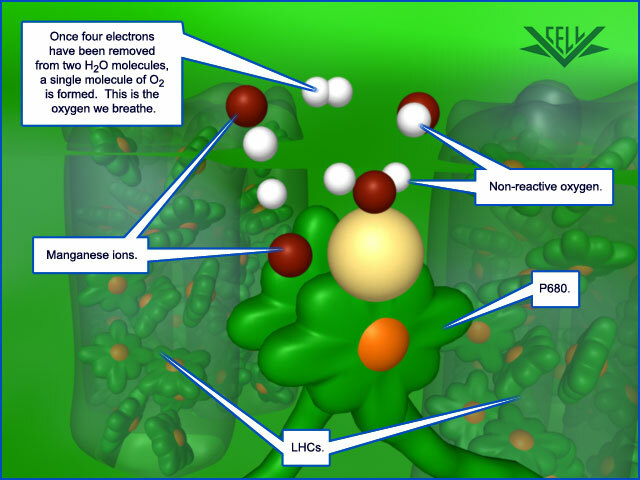 The electrons that are lost from P680 are replaced by the splitting of water molecules at the oxygen evolving complex (OEC). Each water molecule provides two electrons to P680. After two water molecules have been split, the remaining oxygen atoms are combined to create one molecule of molecular oxygen (O2). 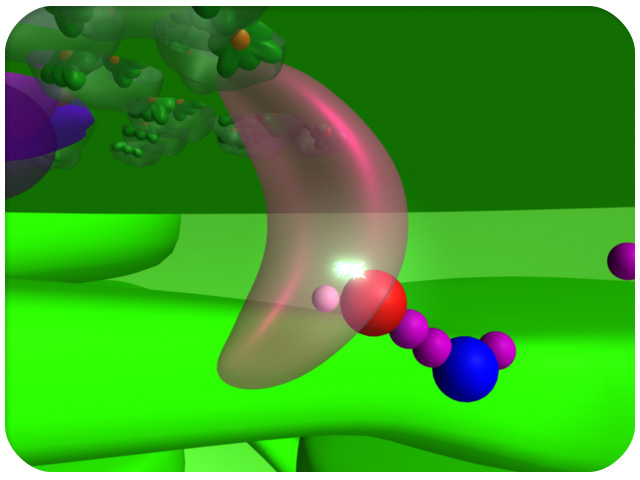 Plastoquinone Qb (magenta) transports two electrons to the second complex in the photosynthetic ETC--Cytochrome b6-f. 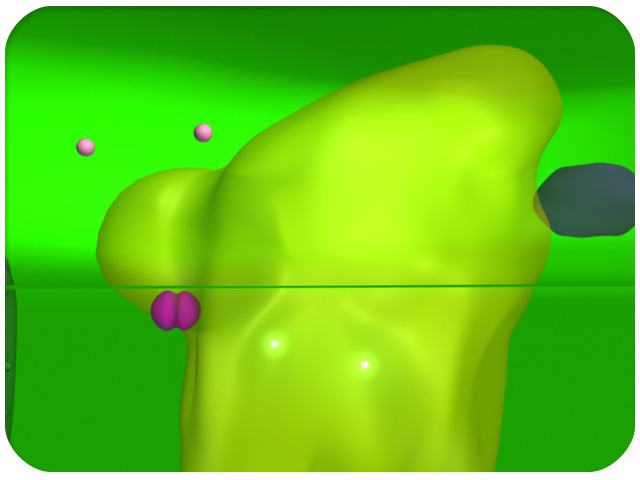 When it reaches cytochrome b6-f (yellow), Qb releases the two protons it picked up from the stroma into the lumen space and transfers the two electrons it picked up from photosystem II to the cytochrome complex. 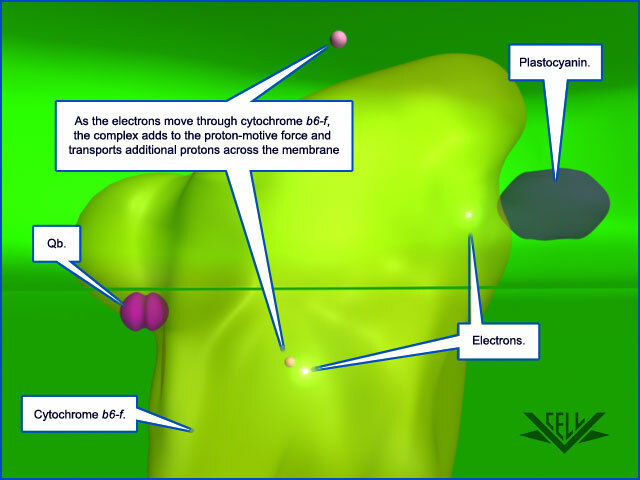 Coupled with the transfer of each electron, is the pumping of another hydrogen ion across the thylakoid membrane into the lumen by the cytochrome complex. 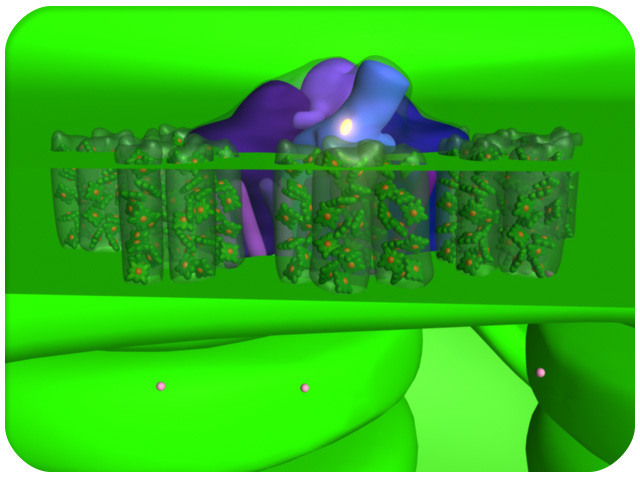 After cytochrome b6-f pumps the additional protons across the membrane, each electron is transferred to plastocyanin, the next mobile carrier (dark blue). 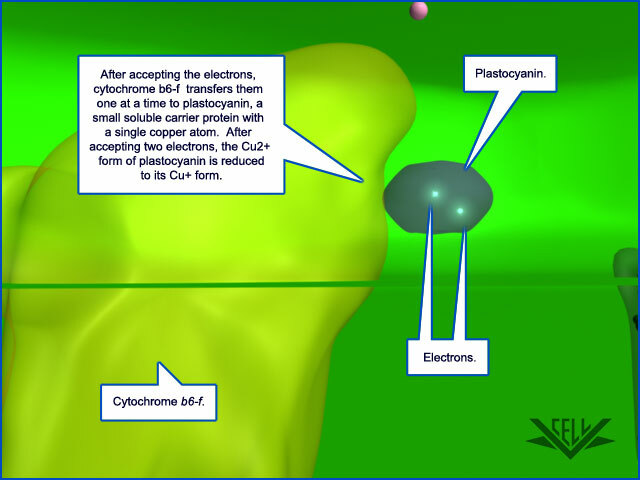 Plastocyanin then transports the two electrons to Photosystem I. 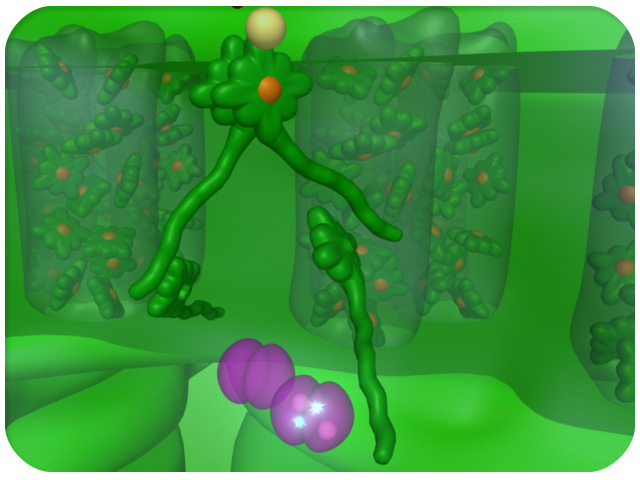 Like photosystem II, the photosystem I complex contains an antenna for capturing light energy called the LHC. 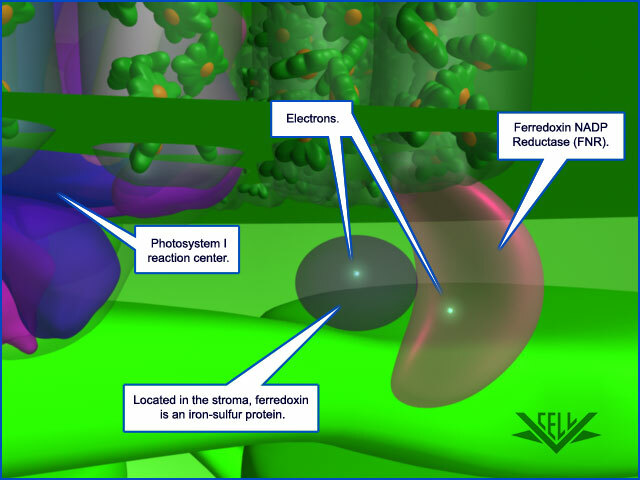 Inside the photosystem I reaction center, each electron is re-energized by the resonance energy from a photon of light. It is then transferred to ferredoxin, another mobile carrier (purple, bottom right). Ferredoxin transfers each electron, one at a time, to Ferredoxin NADP Reductase, otherwise known as FNR (pink). Once two electrons have been transferred to FNR, they are joined by a hydrogen ion and a molecule of NADP+. 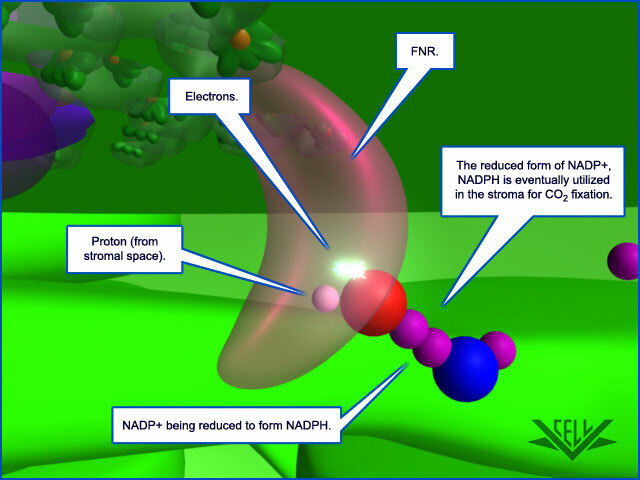 FNR then reduces NADP+ by adding to it the two electrons and one proton--creating NADPH. 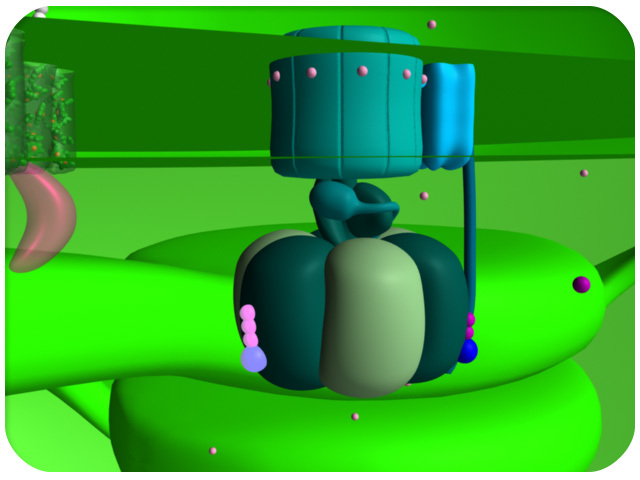 ATP synthase accepts one proton from the lumen space and releases a different proton into the stroma space. This creates the energy needed to synthesize ATP. It must do this three times to synthesize one ATP. This transfer is powered by the proton gradient created by the other complexes in the photosynthetic ETC. 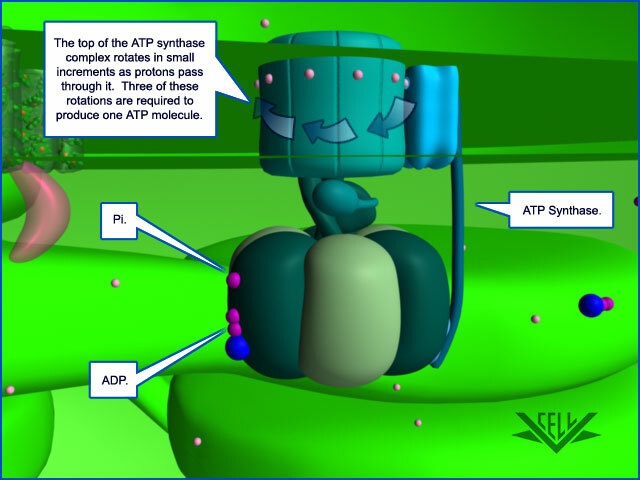 ATP synthase creates ATP from the substrates ADP and Pi (inorganic phosphate). ATP, NADPH, and O2 (molecular oxygen) are the vital final products of photosynthesis.